Ferocious winds constantly blast through the rough terrain of the peak. It offers a good viewpoint of the Banishing Winds territory. However, it is not suggested that one stands too close to the edge for an unseen threat looms and no one wants to drop hundreds of feet down. There is always snow on the peak, no matter the season. The peak is located up and above the Evergreen forest; it gives those brave enough to scale it a beautiful landscape to see. A group of wolves explores the peaks, trudging through deep freshly fallen snow. The territory is sprinkled with the light powder, and winter has finally come. Intrigued with the new territory still, an idea had come to mind for an exploration trip through the snowy mountains. However, a single step could result in an avalanche. And it shall. Wolves will become lost in the grip of the avalanche, and then the remaining members of the group must search to retrieve them before their lives are lost to the cold grip of the packed snow. To opt-in to become one of the lost wolves, please post in the announcement topic topic. "Look at this view!" Linnëa whispered to the others in excitement. The newly appointed alphess's tail waved back and forth contentedly, her darkened winter coat flying every each way in the frigid wind that moved over the peak. The female did not mind it though, her coat was thick, she was healthy and conditioned, and it only felt frigid on her paws, nose, and eyes. Her feet were picked up high in each step as she carefully led the group, trudging through the snow. Her legs were burning from the exertion, but she did not mind. She was a traveler. It was normal for her. As well, her left shoulder no longer echoed of the disaster the pack had suffered in it's last territory, and her sickness was just a dim memory. The view was indeed amazing. All around them was a large forest below, along with the sea glittering vibrantly in the distance. Then, the drier plains, and in the distance a human settlement. The forest was what made the female the most excited, it was such an invigorating thing to see. The female, however, was oblivious of what would happen to her in just an hour or so. For now, she was blissfully unaware of the predicament she trudged into. For, wolves were not experts on mountains. They were wolves. She looked back to the wolves that had decided to accompany her with a bright smile, before returning her gaze to the area before her. “It is something else, but let’s not get caught up in sightseeing.” He warned, though the warning was not harsh and in fact it was said more as a reminder than an actual warning. As he continued walking Crimson, took a moment to glance at a smiling Linnea. She had recently been promoted and now held the rank of an Alpha within the pack. The decision to make her the new alpha female was an obvious one, because the khaki colored female possessed many different qualities and each one made her prefect for taking on the role, Kira had left behind. Quietly, though Crimson allowed himself to peel his gaze away from Linnea and focused them on the ground below his paws. “Watch where you all place your paws, the ground may look safe, but it does not always show the truth.” He added in, his voice audible, but not loud. As he continued to walk, other thoughts seemed to burn their way into his mind. Thoughts about the red colored female Adena. "Indeed. But it is a beautiful sight to behold." Linnëa replied calmly, her eyes lingering for one more fleeting moment. Her gaze then broke and she focused back on the path before her. Crimson was right, the mountain was dangerous, but did she really understand what he meant? Yes it was dangerous to fall, but what other dangers were there other than slipping and falling to ones death? She was not sure. As well, the place she had resided in before had been mainly flat, apart from warmer than this territory. There had been cliffs and lower mountains, but they were not snowy as this place was. Confused slightly, her ears pinned, but moments later she reaction disappeared. The ground? Linnëa thought, looking down to the snow beneath her paws. The khaki female was still slightly confused. Thinking about what he meant, she remembered a few words from her largely fogged past, one where she had been attending a Guardian's lesson from her birth pack that was about traveling. Beware of mountains capped of snow, a wrong step and the snow will flow. She got the meaning for the most part. What had they been called? An avelance? No, no... An avalanche. I must not ignore him then, he obviously has more experience here than I. She thought. It was okay though that she did not know of avalanches. She would learn soon. Lelio padded behind the alpha pair. He thought about life over the past few weeks, Linnea, the lovely female in front of him had been named alpha, much to no ones surprise. She was perfect for the job, or so he thought, plus it was always good to have a beautiful creature like her at the front of the pack. Lelio kicked a pebble in his path and sent it over the cliff they now stood at. Surprise of all surprises Lelio had been named Lead Guardian, the position his father had once held, or so he had been told. Lelio looked out over the territory, it was really beautiful, he had grown up in a land not unlike this one, just smaller. He knew of the dangers, but had come to accept them as a fact of life. Lelio let his gaze travel back to the female in front of him. He wished he could get to know her better...if might be fun. Linnëa turned around to take another glance at the wolves padding behind her, as well as the territory beyond them. What caught her eyes, however, was the Lead Guardian looking at her. The khaki female was somewhat caught of guard by this, it was not often that one stared at her. She pinned her ears confusedly, but otherwise hid the full extent of her reaction. "Hello." She said simply, as she slowed her pace to match the male's so that she walked next to, but just in front of him. She was placed closest to the edge of the lightly snowed slope that laid to the right of her. Her eyes then trailed back to the mountain as she gazed at the expansive rocky spire. There was a strange feeling coming over the female now. It scared her somewhat, as if she was at the wrong place at the wrong time. Or she was forgetting something. Lelio hadn't been aware his staring had gone noticed. "Why hello, what brings you back to me?" He said in a different tone then usual (think Sean Connery XD), when the very female he had been staring so intently at, came back to join him. Though when a look of fear crossed her features as she looked over the sloppy abyss all thoughts of flirting drifted from his mind. "What is wrong?" He asked his own eyes searching each crevice for secrets that may harm the pack. That is why he was named Lead Guardian, was it not, because he could protect the pack like no other? He had been feeling the same emotions as the female beside his but had pushed them aside as mere annoyances. "Why hello, what brings you back to me? "Thought I might say hello." The khaki female replied kindly, giving Lelio a small smile in reply. She kept a smooth, loose pace next to him. Her long legs were good for many types of travel, whether through snow or swamps or through plains and forests. She could cover ground quickly and efficiently without expending too much energy, and obstacles were no problem. She could leap over tall fallen trees, wide branches, and several obstacles in a row without loosing speed. It was very helpful indeed for when they traveled like this. Alphas were meant to lead, not to lag behind. Her mind continued to wander from subject to subject at random and in no particular order like this for a few more moments until her thoughts were interrupted. She pondered this question for several moments. What was wrong? What was this strange, disconcerting feeling that brewed inside her like boiling stew? It disturbed her and caused her heart to be at unrest, and her mind to be far more alert than it normally was when she traveled. Normally, she would be in a robotic state where her body went into an autopilot sort of mode and her mind was quiet and at rest. But not now. "I have a strange feeling that is causing me some.. Mental unrest." She replied quietly. It was so only he could hear. She did not want any wolves that may find her current state of mind silly or stupid. She pinned her ears. If only the female listened to her mind. But she was more intent on calling her feelings and ideas silly for fear of them causing her something she did not want. Spirit walked in silent observation behind the others, bringing up the rear of the group trekking across the snow tipped peaks. Conversation drifted to the landscape and the view that presented itself to them. Spirit allowed her eyes to drift off to edge of the rocky pathway and beyond. Trees stretched across the land in a sea of green, stirring a longing feeling in Spirit. She was not one to mind the snow (for she was best at hunting in it) but the cover of trees brought shelter to the female and up here on the open cliff she felt vulnerable. Shaking her fur free of the clumps of snow that began attaching themselves to her, Spirit turned her attention to those in front of her. Linnea had dropped back a few paces to walk along side Lelio. The Delta didn't bother straining her ears to listen in on their conversation, she didn't feel like intruding nor did she have the energy. Their smiles soon dropped as the conversation turned serious; Linnea whispered something to the male that was meant to be inaudible to the rest of the wolves. Spirit looked away, she wouldn't bother herself with it. Free of watching the others, Spirit gaze traveled up along the slope to her right and up to the snow collected at the top. She didn't trust this rocky landscape in the least. The snow was light and cold underfoot, it crunched quietly with each careful step she took. Adena was acutely aware of the fact that they were in danger. It wasn't just the snow itself, it was the entire area. Snow drifts were the most likely occurrence. Adena had no outer signs of her mild anxiety, but she knew that they would have to be careful. As Linnëa whispered something and it echoed off the surrounding trees, Adena flicked her ears in the other female's direction. She had recently been promoted from the delta position to alpha female, and was leading the pack alongside Crimson. He had also asked Adena herself to be his second, alongside Gale. She had answered by stating calmly that she would, though internally she was shocked that someone would trust her to fulfill these duties. She had mostly isolated herself from the others and made herself more useful and to seem worthy of the position, though she knew that a certain amount of that duty was to interact with her pack-mates. Adena simply grunted quietly in agreement to Crimson's statement, though she scanned her surroundings with wide, icy blue eyes. The snow encased the trees, and the sky was a dull, grey shade. It was quite beautiful, though in a sinister, cold way. Adena hadn't said a word since the group set off, and then she wouldn't have much to say unless it was to do with where they were heading. The group was further exploring the new territory and she was busy building a mental picture of the place. She had investigated much of the territory, from the barren badlands to the rich woodlands, though only with this group did she come near the mountains. She had to cover all the ground of their new territory and felt like she had to know it very well. Only then would she truly relax. Adena knew the risks of this situation. She walked at the front of the group, trying to ensure that they were all safe. She was careful, padding along warily with each step placed with caution. "Indeed. But it is a beautiful sight to behold." "Beautiful but dangerous," Adena muttered softly after Linnëa spoke, more to herself than to anyone else as she slowed down to join the rest of the group, deeming the area relatively safe. She still walked at the front of the group, but was now part of the main body of wolves. Linnëa had fallen back to converse with Lelio, the male that had recently been accepted into the pack, and whispered something inaudible. But her posture told Adena that something was troubling the female. She too was anxious to get the trip over with and get everyone back safely. The rest of the group seemed quiet, though maybe it was just the snow that made everything seemed still and mute. Adena turned away from the group and fixed her gaze on the snow before her, intent on keeping out of the others' way. Phantom's large paws gripped the snow covered terain. He growled as he slipped a bit. After regaining himself, he slowly gained in speed to catch up to the others. He was near the end of the traveling group but not dead last. He slowly turned his head and looked down the path they had choosen to take. His mate was down there, alone with the others. Few of the wolves had choosen to go explore this dangerous half of the territory. He grunted and wished that she would be okay without him for some days. It wasn't like he was never going to come back. He would, evenutaly. He shook his head and gazed around their surroundings. It was very beautiful to see most of the pack's territory. I wonder what it's like to be at the top? he wondered. His ear's began to flick in some ways as his traveling pack mates spoke of the land and it's beauty. "I've never seen anything like it before. Even through my years of travel." he said. "We're lucky to call this land ours." Listening to the others, he smiled a bit. So this was what it was like to be apart of a great pack. He'd been a scout for quit some time now and porved himself as well as giving an idea that everyone liked. He felt at home with these wolves. They were his new 'family'. The alphas could have ran him off or even killed him for stepping into their territory but, no they did not. Instead he was named a scout for his speed. I think I've found my home, he thought, it's a great life to live here with everyone. "I hope we find what we're looking for up here." he said softly under the sound of crunching snow. Looking about still with the steady pace keeping him moving. "Good thing i'm part artic wolf." he laughed quitely. He was completely acustomed to this type of weather. He was from the great northern parts of Canada, beside Alaska. He was used to this weather and absolutly loved it. After being released into the lower boarder area of Cananda. Phantom, Willow, and Timber found themsevles eating strapes off the road, begging for food until they learned to hunt for themselves, trying to live another day until they came itno the new land they were in now. Time passed, and the trio of wolves seperated and never saw eachother again after that. But Phantom was living the good life, or so he thought. He had a pack, a mate, a great home, and everything that was good. The male kept continueing onward with the others next to him, front and back of him. All his sense we're up on their high point as due to being in this new area where something was always there. Arisah picked her way along carefully as the group moved forward. As usual, she had navigated herself somewhere in the middle of the small portion of the pack that had elected to go on this expedition. From her vantage point, she could see, or at least hear, every wolf in some way and unconsciously keep tabs on their wellness. Since joining the pack, she had fallen enthusiastically into her duties as a scholar, learning more about the resources around them and helping out whenever possible. In truth, she loved every moment and, almost as much as the wolves themselves, her duty gave her purpose and made her feel at home here. So it had, of course, been with great enthusiasm that she had volunteered to participate in this trek: it would be an opportunity not only to get to know the lands and their resources better, but a number of her packmates. She smiled to herself as she watched them move forward, commenting on the landscape and talking among themselves. Hearing Crimson's warning to watch where she placed her paws, Arisah immediately nodded: the last thing that she, every the clumsy one, needed was do was stumble on this mountain. Catching Phantom's comments, Ari had to echo his sentiments, "Agreed, this is like no where I've ever been." She was a wolf of the forest. Endless seas of timbers, not peaks, were what she had always been used to, and while there was a kind of beauty in that which would always hold her heart, there was definitely something to be said about this landscape, foreign thought it was. At least the snow was familiar, with it's fierce chill and cautious footing. The forests where she had grown up had been pelted with blizzards each winter. Phantom's joke brought a quiet chuckle to the she wolf, "Unless you trip. We might not find all that white fur in this snow," she joked back, with no idea how terrifyingly accurate that might come to be. Falco moved over the plains, a hare present in his jaws as his long tail swished highly over his back, his trot was brisk yet smooth, and effortless for the male. His gleaming white coat reflected any light that touched upon it. Even in the snow, his coat gleamed. The male had followed the pack up Windy Peak. The white male was a little behind them but he could still see them up ahead. After all they had a few hours start on him and he had to pick out their scents finding where they were headed. Falco's head dipped slightly as he got closer to the peak of the mountain, and closer towards the pack. He shook his fur, it was moderately long and dense, Just like his mothers, an arctic wolf of which he possessed many of her traits along with his fathers, a grey wolf. Falco was the size and build of a grey wolf but had the pelt of his mother, and inherited her grey coloured eyes. The male looked around as he reached the top. Moving over and sitting with the pack. He dropped the hare on the ground in front of himself, the blood that had stained it transferred to the snow, leaving a red small coin sized bit of blood underneath the hare. Laying down in the snow, Falco removed the skin of the hare and started to chew on it. Crunching down on its bones with ease. His tail wagged slightly as he lay about watching other members around him. Lelio's brow furrowed, he looked around, was that what his senses were trying to tell him. "I have a feeling you may be correct alpha. Be watchful" He said "Perhaps you should stay here, you don't get safer than me...that sounded a lot less conceited in my head." A laugh escaped his muzzle, yet his eyes were wide. He wasn't used to letting such things out, especially around females. "Sorry that was really horrible, but you know, Guardian here, kinda supposed to keep you safe. Not that you couldn't take care of yourself of course, you would not be alpha without being able to take care of your self, what i am saying is...That i am going to shut up and stop talking" He looked away embarrassed. Linnëa nodded, though most words after her last replies fell on deaf ears. This feeling of looming doom was causing extreme stress to build in the light khaki female. her paw steps grew more rapid, and her eyes were beginning to look more and more wild. She was dearly hoping this feeling was just nothing, just a feeling. The female was wrong to think this though, and if she had only listened to her instincts the oncoming disaster would not have involved the alphess so deeply. Because, as she took up a position in the front of the group next to Crimson, the disaster occurred. The ground began to slide beneath her paws as a sheet of snow was moved. A sharp gasp escaped her, about half the group was on this moving snow now. An avalanche. That was what her mentor had called it. In an act of preservation, she shuffled around before finally meeting her goal. Her head collided with the alpha male's side as she knocked him off this sliding snow, but there was no time for her to move off of it herself. Trapped on it, she found the only way out of the sliding sheet was to flee. For now, it moved slow, but quickly gained speed as it moved towards a steep slope. Her paws were frantic as she ran like prey away from the frothing wave of cold. An alarmed howl escaped her maw. It was not just melodic, it was filled with terror as it was not only a lament, but a warning so that others could make a quick escape before they were trapped. Her strides grew longer and longer, and for a few moments it seemed she would escape. But that was until disaster struck the female. Linnëa's shoulder locked up and pain seemed to shear it in half. She let out a noise that was almost like a scream, but it was a loud screeching yelp of pain and horror. Her past wound was out to seek it's last bit of revenge on the khaki female. As it did so, she found her coordination gone. Her front legs folded as she crumpled and began to slide just in front of the snow. Her senses flickered. And, with one last burst of speed, the avalanche consumed the alpha female and darkness enveloped her. <blockquote>Every fiber of her being was telling her to turn back and run. Every instinct that made her screamed her name, saying to leave this place, and leave in a hurry. Mina didn't know why though... there was just a feeling in her gut that she shouldn't be here right now. A feeling that said she should just come back later, when her life wasn't at risk. But then again, her life at risk was the female's least concern. She was more concerned with the fact that this group of wolves she was following wouldn't accept a stranger such as herself. Of all the glimpses she had caught of this pack, she had seen no indication that they weren't a very tight knit family. They all seemed so close and knowing of one another, that a stranger might just screw things up, if anything. But a family is what Mahina was seeking, what she needed more than anything at the moment. It was kind of stupid not to listen to what her instincts were telling her, she would soon find out. Her eyes were trained upon the group that stood below her. Just a minute of scaling some rocks and she would be smack in the middle of them. Which, certainly wasn't a good idea. A stranger disturbing whatever was going on probably wouldn't mean a good ending for anyone. So she just watched, fighting with her inner self on whether or not to venture towards the wolves below. She didn't have time to think about that though. Right before Mina was about to go and put her fate into the paws of these wolves, the earth began to shake. Stricken with a sudden panic, she closed her eyes and silently hoped it wasn't what she thought it was, an avalanche. But when she dared open one eye, she saw half the group of wolves starting to slide on the moving snow. A khaki colored wolf at the front, she saw, shoved another wolf away, and an ear piercing howl escaped from it's maw. Only a few seconds later the wolf screamed, which made Mahina shrink back in fear. These wolves were in trouble, and she couldn't do anything unless she wanted to risk dying, which wasn't a feat she was going to achieve for a few strangers that may not even take a liking to her. Total and paralyzing fear glued the female to the spot, while she watched the snow carry some of the wolves away. This wasn't what was supposed to happen, not now, not here, not to these wolves. Mahina cursed the ground she stood on, and in her mind begged it to just stop and leave them alone. From what her confused mind could tell though. It wasn't going to. Occasionally one was caught up in something bigger than themselves or simply made one bad decision that led them astray. This had happened to Finn during his absence without the Banishing Winds Pack. After his encounter with Arisah and seeing that Linnea was cured, Finn decided the best way to celebrate this was to go explore. Searching for a partner, he found none, which worried him deeply. He hated being alone, and going off on his own was completely out of character for him, but his curiosity certainly wasn't. One thing led to another and Finn ended up lost in unfamiliar territory. An evenings rain washed away any scent trails that would lead him back to his new family. Nevertheless, Finn was a survivor and managed to hunt himself, and guarding was much easier when it was only one wolf to guard! For a time he thought perhaps he was simply to be left alone for the rest of his life and it was fate which led him astray. However, deep in his heart Finn knew this life of solitude was never- and couldn't be- for him. He missed his packmates terribly, especially those whom he had managed to befriend in the short period he had been around. Thoughts swirled in his mind during this time- did the pack think he was dead? Were they surviving and thriving? Where were they now? These questions spurred Finn to make an even greater attempt in getting home and soon he found the scent trail of a Banishing Pack member, following it home. When he got there, however, no one was around. Where had they gone? Had they simply disappeared? Finding even more scent trails, he knew it couldn't be true. Walking by himself and desperate for social activity, he followed them to the mountains. And this was when he saw the small group trudging through the snow, most unfamiliar to him. He was no wary wolf, especially of strangers, though. Trotting fast enough to catch up to them, yet having some trouble because of the deep snow,, he let out a small yelp that would alert them of his presence. Perhaps some would remember him? He hoped so. Joy filled his being as he was back, his fear of loneliness greater than ever and he hoped his curiosity would not lead him astray again. As he ran closer, Finn noticed that the group seemed smaller than when he had left. He pushed these troubling thoughts away and allowed the happiness to overcome him, at least for now. But as he approached it seemed like the whole world was protesting with this reuniting of a wolf and his pack. The ground underneath him seemed to growl as it shifted back and forth, preventing him from gaining steady ground and instead turning him into a rolling, snow-covered ball. The world was spinning as he lost control of all movement and started sliding down the slope. Kitara stood at the base of the mountain not feeling the power to clmb the large slope. She placed one paw forward and started slowly trotting towards the peak. About half way up she plopped down into the sodden ground and sighed. Her mind swirled she was too tired to move an inch further. As her breathing slowed she got back onto her paws her stomache rumbling and her mind swirling she was unbalanced. When she took a step she clumsily slanted towards the ground and wobbled. But she had to reach the top before midnight. Or she would be left unprotected starving and lonely. Arisah's attention was suddenly drawn away from the group by the sound of an approaching wolf. Ears flickering, noting that there was something vaguely familiar about the voice that yelped out, Arisah turned in the direction from which it had come. Sure enough, a little ways behind, was a figure Ari hadn't seen in a while--in fact, she was surprised to see it at all. After they'd planned to find plants to heal sick Linnea, who seemed to have gotten better of her own accord, the male had seemed to disappear. At first, as she was known to do, Arisah had worried and wondered about her lost packmate. Finn was one of the few she'd actually spoken much with, and had been considering him to be a friend. But after a while she had let herself assume that either he'd decided to strike out on his own or was simply off scouting for the pack. Seeing him approach, she was left to the belief it was the latter, and was barking back a hello when it all broke loose--the snow that is. Suddenly the ground beneath her paws was rumbling and falling away, a churning mess of snow and danger. Pale gaze flashing around to her pack mates, Arisah did her best to keep moving, trying to follow some of their leads and get off the moving mass of white. She watched as Linnea pushed Crimson away, then heard with horror the sound of her yelp as she stumbled and disappeared into the snow. Distracted by the scene unfolding around her, ever clumsy Ari suddenly lost her own footing, tripping over a large chunk of rolling ice. With a frantic bark, she too sunk under the swimming sea of white, unable to regain her footing in time. Lelio felt the rumble of the earth below him and his tail tucked between his legs as his eyes widened. His eyes gazed upon the rolling waves of white before they crashed upon the wolf. So unprepared was the guardian that he was unable to regain his feet. Swept away by the increasing pace of the avalanche, Lelio was bashed against every sturdy rock on the way down to where ever their end may be. Fear speed his heart faster than it was meant to go, and still pains came, bruises were already beginning to form as his body was pushed against yet another rock or tree or what ever had hit him. the last thing he thought, was that he should have stopped flirting and done something about his life, before the world went dark and the snow piled on top of him. Kitara woke at the jolt and rumble of the earth and she limped down the mountain to where the snow and debris was falling and stood there wide eyed and heart racing. she heard the yelps and whines of the wolves. So she tried to get a better glimpse of where they were, but there was no wolf in sight. So as things started to calm she hopped onto the pile and began searching for the wolves. She could see Crimson's form from where she had fallen back to. Linnëa walked beside him, and Adena felt a twinge of something. She didn't even want to admit to herself the little hint of jealousy that washed over her. It was irrational, but she was beginning to comprehend that she had no control over what she thought or felt any longer. Before the Banishing Winds, Adena had been a solitary, independent female, letting only herself be the judge of situations. But now.. was she going soft? The thought made her slightly nervous. The way Gale had pressed his flank against hers hadn't made her jump away as if scalded. No, she had stayed with his grey fur brushing her red coat, feeling like it was truly on fire. She was going crazy, wasn't she? And she hadn't missed the way Crimson's eyes met hers, either. What had she gotten herself into? For the first time since joining the pack, Adena genuinely considered leaving. She didn't want any of this mess she had allowed herself to create. And that was what troubled her the most: she let herself get stuck in the middle. It was absurd. Before, she would never have let her frosty exterior go, but now it seemed that it had melted without her realising. Leaving seemed a logical solution to her problems. Could she really allow this to develop any more than it already had? To let it grow and flourish? She couldn't. It was unnatural for her. But to depart was to hurt those she was leaving behind. And the last thing Gale needed was for another close friend to walk away. With Elysia, then Taru, would he cope with losing another? But perhaps this was all happening in her mind. Adena thought back to when she first joined. Gale had been a formidable, menacing force that wound Elysia up whenever he found the chance. She had experienced first-hand how harsh Gale could become. She recalled the words he spat at the brown female. She remembered the rage she had seen in his eyes, yet he cared for her. He was not that Gale any longer. That Gale had been sinister and cold, quite unlike what he was now. But with Taru, she knew he had changed into a gentler male. It was Taru and Elysia that had changed him; Adena had little effect. When Taru left, Gale became almost self-destructive. However, who was to say that he didn't simply care for Adena as a friend and nothing more? But did friends press their flanks against one another wordlessly? Not to her knowledge. But what was she to him? Would he even have known of her existence if both those females hadn't left? And Crimson had placed his trust in her loyalty when he gave her this new position as his beta. She couldn't leave because she knew him well enough to know that he would feel betrayed at her leaving because of his view on loyalty. Not only that, but Crimson was Adena's friend - something that wasn't an easy title to earn with the female. She couldn't leave. This was her home. One moment, the air was still, calm and she was caught up in her own troubled thoughts. The light but biting breeze whipped her fiery fur gently and only noise was the murmurs of conversation. The next, before she could register what was happening, she was in flight, racing away from the ominous, tumbling wave of snow that was rolling down the slope towards the pack. The wind howled dangerously in her ears as they were filled with the sounds of falling snow. She scrambled through the deep snow as fast as she could as terror fuelled her, leaping frantically. Her silver eyes couldn't see through the flakes of snow heavily shrouding her view, so the femme couldn't see any other fleeing forms. All she could think was that this was her fault. If she had been more vigilant, she would have been able to see that the avalanche was coming. If only she hadn't been caught up with thoughts of Gale, and of Crimson. Her insides clenched in apprehension and fear for her pack. How could she not have seen this coming? It was her fault. If she had forewarned them, they would have been able to clear the area. But she hadn't been looking. The rush of adrenaline and alarm coursing through her body was enough to spur her on, out of the avalanche's clutches. It was only then that she turned, her wide, shocked blue eyes skimming the area, the snow, and the shadows for signs of the rest of the group. Was Crimson safe? Was Gale safe? Adena's flanks heaved as she gasped for breath. Panic-stricken, she could only watch as snow fell upon snow, continuing its destructive path downwards and away from Adena. The pack was scattered across the area, but Adena was so disoriented that she couldn't focus her attention on finding anyone who was lost in the snow. Where was Linnëa? Spirit? Arisah? She started to push her way back through the light, fluffy snow into the path where the avalanche had passed. She glanced about her despairingly. This had been a disastrous idea to begin with. She had failed in her new position. She had failed to protect the pack. The world. What was going on? It shook and threw the wolves around like they were little leaves. The pack. Where were the rest of them? Pain shot through the young female's body as the snow that layered the mountain was sent into an avalanche. Life seemed to come to and end as Liafi wondered what it was that she was supposed to do. Run. That seemed to be the only thing that was smart to do at this point. Her paws flew faster than she had recalled running at any point before in her life. The could of snow that was behind her ... it was too hard and risk the look that might give her the strength to continue on. Of course, running was what came to her naturally. She had a history of running from things. This was no different. But, when would this terror stop? Falco jumped to his paws with a slight yelp as the ground started moving from underneath him. The limp body of the hare was tossed and turned already meters away from him. He turned and tried running against it, it seemed that he was getting no where as the ground kept sliding under him. The ground started moving quicker. Falco's legs couldn't keep up with the pace that the avalanche was falling at. Soon the white male tripped over by a lump in the snow, a rock? He found himself sliding down on top of the ice sheet. He whined and attempted to get to his paws. Falco managed to crawl to the side of the ice sheet - as he was near it to start with. Falco edged to his paws, his legs shaky on the moving surface, he looked down spotting a small ledge. It was coming closer and closer at a speed that Falco had no idea of. The white male leapt for the ledge as it neared. Falco felt pain his his chest as he thought he landed at the top of the ledge. But he had not, his fore paws hung onto it, his ribs had slammed against the side of the ledge. His hind quarter scraped the side as he tried to climb up. Falco eventually pulled himself up on the ledge, which he laid clung to his belly on the ground claws were extended to hold on as if, the ledge itself was going to fall away. His long pink tongue extended from his maw as he huffed. The white male looked up to see other pack members trapped on the moving snow. 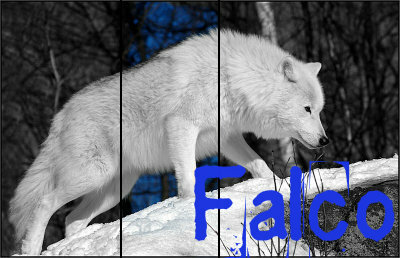 Falco gave a whimper for their safety as he looked around, finding himself stuck on the small ledge with no where to go. For a moment it seemed time was moving in slow motion- wolves were falling, trapped underneath the snow. Then he fell too. The world was spinning as he rolled down the slope. Then time sped up again and it seemed only a few seconds later everything was still, for him at least. There was a deathly, cold silence. Finn realized just then that his eyes had been closed for the whole ordeal. Opening them, he attempted to assess his situation. His golden eyes yielded no facts, however. 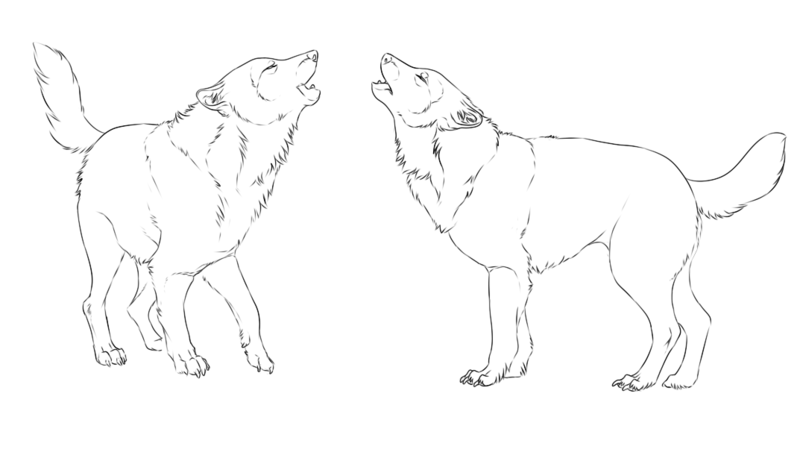 It was completely dark, except for the small amount of sunlight that managed to bleed through the snow. So, he knew he wasn't dead. That was a start. The next course of action was to see if he could still move his limbs. Both his back legs were fine, as well as his front. Somehow he had not broken any bones, though some places stung with fierce scratches. He'd definitely have many bruises in the morning. Finn tried to make as much room as he could, bracing his legs against the compact snow and pushing upwards in an attempt to be free. A few tries later, he managed to make a small hole in which sunlight burst through. Pushing harder, finally, his whole head came out and he could see his surroundings. It was all silence. He could see no other movement from where he was down nearing the edge of the slope. Snow covered all the surfaces it could, and he saw some particularly deep drifts. Finn prayed that these held no pack members. Pushing the rest of his body through the snow, the male realized how lucky he had been that the snow had been so shallow where he was laying- at least the part above his head. Moving his head to look at where the avalanche had started, the male saw a wolf higher up that managed to get a firm grip on a ledge of the mountain instead of sliding all the way down. He saw a few pack members even further up who didn't get caught by the sliding ice and snow and were still standing on the path that was being traversed. Shivering slightly, Finn wondered what he should do. Looking back at himself to do another bodily check, he saw drops of blood dripping from a would near the start of his leg, likely a scratch from where he had rolled over some stones or even ice. Finn was at a loss for what to do now, instead remaining where he was and hoping some leadership would be said to him, for he was not a leader. Simply a follower.